The automatic winding watch converts motion of the wearer’s wrist into power that winds the mainspring of the watch. 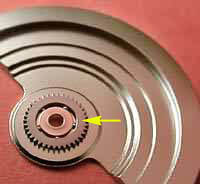 As show left (in an inverted position), most such watches use a central rotor with a gear (yellow arrow). As the rotor moves around its central pivot, the gear winds the watch. 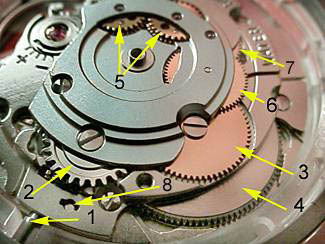 In the second photograph, a typical contemporary automatic winding system is shown with the central rotor removed. This is a ETA caliaber 2842. Identified parts include (1) the opening for the winding stem. (2) The crown wheel (which transfers power from the winding stem to the ratchet wheel, arbor, and mainspring during hand winding). (3) The ratchet wheel (on top of the barrel and attached to the arbor and mainspring at the center of the barrel). transmit power from the twin click-wheels to the ratchet wheel. Because the ratchet wheel must always wind the mainspring in one direction (counterclockwise in the view at left), the twin click-wheels convert rotation of the central rotor in either direction into power that will wind the mainspring.